It’s a long way from central London to Kakadu national park in Australia’s Northern Territory. When Rio Tinto’s chief executive, Sam Walsh, addressed shareholders at the company’s annual general meeting last week, there was a strong sense of the distance. Walsh refused to offer any guarantees that the mining giant would help its Australian subsidiary company Energy Resources of Australia (ERA) clean up the site of its Ranger uranium mine within the park. The Ranger mine was in the news in December last year when a leach tank containing 1.4m litres of acidic radioactive slurry leaked. Walsh’s words were alarming for Mirarr traditional owners who live in the park and are no strangers to negotiating with mining companies. They are anxious about ERA’s commitment to the rehabilitation of the site. ERA is obliged to ensure it is fit to be be reincorporated into the park by 2026. 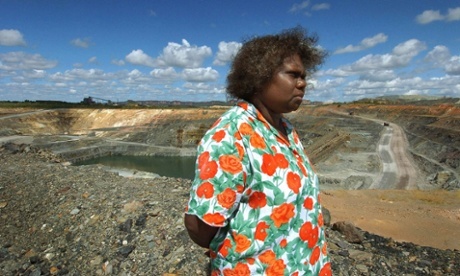 The traditional owners fear that if Rio Tinto won’t take responsibility for the site, no one will. The ERA share price has recovered after a dramatic drop after the spill (its shares lost 30% in the first three days after it happened), but uranium prices globally are very low. Market confidence has remained poor since the Fukushima disaster, and there have been other blows, such as Germany getting out of nuclear power altogether. ERA has its sights set on massive expansion plans. It wants to press ahead with a new underground uranium exploration alongside Ranger called Ranger 3 Deeps. The underground uranium deposit contains an estimated 34,000 tonnes of uranium oxide, making it one of the world’s most significant recent uranium discoveries. At the Rio Tinto AGM, Andy Whitmore, an activist shareholder, asked Walsh to clarify whether the leak at Ranger had affected the company’s expansion plans and whether it would affect its ability to rehabilitate the mine site by 2026. According to ERA’s investor statement from October 2011 the majority of the $500m raised from the rights issue is earmarked for a “brine concentrator and other water management initiatives” and “the construction of the Ranger 3 Deeps exploration decline”. The concern is that the money might not be enough. Certainly, Walsh’s response did not quell Whitmore’s anxieties. “I don’t think this is going to satisfy the local community,” Whitmore said. The Australian government has been aware of huge uranium deposits in Kakadu national park since the Whitlam government initiated the Ranger environmental inquiry (Fox report) in 1975. When the Fraser government passed the 1976 Land Rights (Northern Territory) Act granting land rights over Kakadu to traditional wwners, the Mirarr were singled out to be denied veto rights over mining. But when the Howard government lifted Australia’s “three mine” policy in 1996, the Mirarr vehemently opposed ERA’s plans for a new uranium mine at Jabiluka, also inside Kakadu national park. The Jabiluka blockade, which drew more than 5,000 activists to the mine site 230km east of Darwin, became an international lightning rod for land rights and Indigenous cultural rights internationally. When Rio Tinto became the majority (68%) shareholder in ERA in August 2000, faced with mounting international pressure, in 2002 its chairman Sir Robert Wilson declared that Jabiluka would never be developed without the consent of the Mirarr. O’Brien says for ERA to make the cleanup of the Ranger site conditional on approval for 3 Deeps would amount to holding the traditional owners to ransom. “We urgently want clarity from the Australian government and from ERA and Rio Tinto on this that our fears are unfounded. Those fears are that we’ll be left with a toxic radioactive legacy from Ranger, and that there’s nobody with pockets deep enough to fund the cleanup,” he said. While not directly responding to O’Brien’s allegations about its disclosures relating to the spill, a spokesman from ERA told Guardian Australia the company was undertaking “progressive rehabilitation” at Ranger, including backfilling an opencut mine with 27m tonnes of material. ERA told the Guardian that “the cleanup from the spill is complete” and said it had a business plan to complete rehabilitation of the overall site. “ERA’s long-term business plan is to ensure that the business can meet its rehabilitation obligations. Ongoing monitoring since the leach tank failure has confirmed that the surrounding area has not been affected and that ERA’s containment systems worked to design, with no impact on Kakadu national park,” the spokesman said. He insisted that the section of the annual report about the need for an additional source of funding for rehabilitation referred to “potential business risk”. At ERA’s AGM this month in Darwin, its chief executive, Andrea Sutton, acknowledged that the Ranger spill had damaged relations with traditional owners. “This is an important relationship to ERA and while there is no doubt that the leach tank incident interrupted our engagement with the Gundjeihmi Aboriginal Corporation, we do continue to engage on a range of matters of mutual interest,” she said. O’Brien acknowledges that on current evidence it appears that the majority of the spill was contained on the mine site, but suggests ERA should wait for the results of the government inquiry to be tabled before pushing ahead with its plans for 3 Deeps.